Philip Dunton Murphy, is an American financier, diplomat, and politician who is the current Governor of New Jersey. (2015 Parade Biography) Philip D. Murphy is a proud product of the middle class and the proud father of – with the love of his life, his wife, Tammy – Josh, Emma, Charlie and Sam. Three dogs, a bird and a hamster round out the family. New Jersey is home for the Murphys. For over 30 years, Phil Murphy’s pursuits have included a highly successful business career, leadership of a range of philanthropic and community organizations, a central role in New Jersey and national Democratic party politics, and service to his country as an ambassador appointed by President Barack Obama. The youngest of four, Phil was born in 1957. His family was middle class on a good day. Mom graduated from high school, brought up the kids and worked as a secretary. Dad did not get out of high school (although he was quite talented) and worked in a variety of jobs, including as a paid pall-bearer and manager of a liquor store. Religion, basic values, work ethic and civic awareness, thanks to Dad, were pillars of family life. So was education, thanks to Mom: all four Murphy kids earned bachelor’s degrees (Phil from Harvard College, 1979) and three earned master’s degrees (Phil from The Wharton School, 1983). Phil’s older brother and best friend, Walter, died suddenly in 1993. His sister, Dorothy, is a social worker and his sister, Janet, is a Boston city school teacher. Phil and Tammy – herself, the youngest of five – have nieces and nephews all over the place! Phil Murphy worked for over twenty years at Goldman Sachs, ending his full-time career on the firm’s management committee in 2003. He worked around the world: in the U.S., Europe and Asia. He built (and, sometimes, rebuilt) and led a succession of the firm’s biggest businesses. He was intensely involved in establishing Goldman Sachs’ presence in Jersey City, NJ where today several thousand persons work. He advised hundreds of companies and institutions and witnessed firsthand how businesses are built, and good jobs created. He lived in the global economy and financial markets for two decades, dealt with rating agencies, investors and regulators and saw where the system worked and where it did not. All in all, he learned a lot, worked hard and got lucky. Civic engagement and philanthropy – which had taken root in his life years earlier – became the main event for Phil Murphy in 2003. Middle class families, social justice, community development and civic society became the principal themes. Phil and Tammy founded 2nd Floor, a hugely successful teen helpline in New Jersey; it has fielded hundreds of thousands of calls and saved dozens of lives. Phil served as board president of 180 Turning Lives Around, based in Monmouth County, NJ; 180’s mission is to be there, in their darkest moments, for women (and their families) who are victims of violence and abuse, to counsel, protect and shelter them and to get them back on their feet. Soccer is a particular passion for the Murphy family. Phil was a driving force in bringing a professional women’s soccer franchise, Sky Blue FC, to New Jersey, and he remains the majority owner. All Murphys play, to a greater or lesser degree, the beautiful game. Nationally, Phil served proudly on the board of the NAACP’s Special Contribution Fund. The NAACP is the world’s oldest civil rights organization. He also chaired the executive committee of Local Initiatives Support Corporation, the non-profit organization that works with local community development associations and has transformed countless urban neighborhoods across the country, including the South Bronx in New York City. 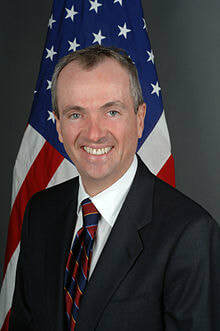 Phil Murphy chaired the New Jersey Benefits Task Force in 2005 which laid out the stark reality of the public employee pension and health systems, and offered a range of potential remedies, including a strong plea for the state to do its fair share (“No More Pension Holidays”). At about the same time, he co-chaired (with former Governor Janet Napolitano and Professor Roger Wilkins) Renewing our Schools, Securing our Future: A Task Force on Public Education for the 21st Century. Phil is passionate about finding bold and scalable solutions to our public education challenges, and about measuring our impact always through the eyes of the child. Howard Dean asked Phil to serve as the National Finance Chair for the Democratic National Committee in 2006. Phil tirelessly raised money for the build-out of a national party infrastructure, and for races up and down the ballot, including the successful recapture of the House majority in 2006 and the election in 2008 of President Barack Obama. During his tenure as Finance Chair, the DNC raised nearly $300 million. Phil and Tammy have raised millions of dollars more for progressive candidates and incumbents. Phil was also a founding partner of the Democracy Alliance, a federation of some of the most consequential progressive organizations. He helped, in its earliest days, with the Center for American Progress, one of the country’s biggest and most important think tanks, and later served on its Board of Trustees. Phil and Tammy have recently established New Start New Jersey, a “think and do” organization aimed at finding, debating and implementing bold ideas that can jump-start New Jersey’s economy from the middle class out. The primary focus is on job creation and job security and the goal is a vibrant, secure and growing middle class. Other than family, this endeavor is Phil and Tammy’s passion. And now to the future. Whatever it may hold, Phil, Tammy, Josh, Emma, Charlie and Sam are up for it. They are strapped in, fully charged, ready to lead and raring to go.